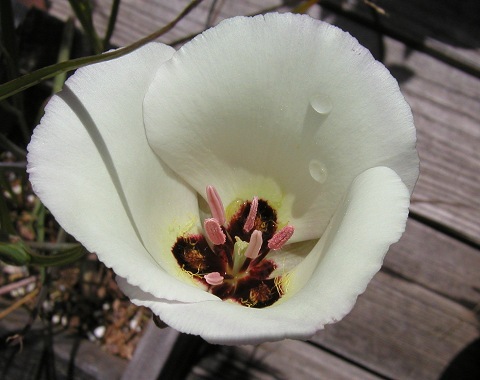 Calochortus catalinae S.Watson is found in grassy places near the coast from southern California to Baja. 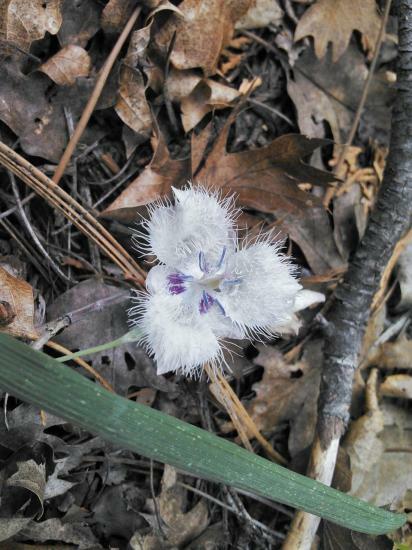 The flowers are large, white to lilac, usually with a purple spot at the base of each petal. 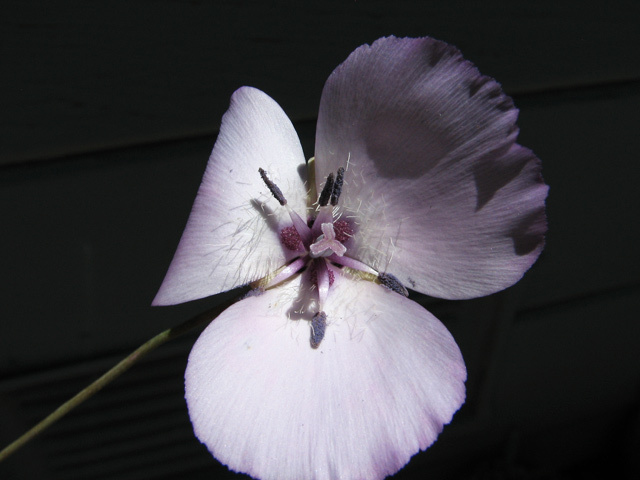 Petals are naked except for a few slender hairs near the base. 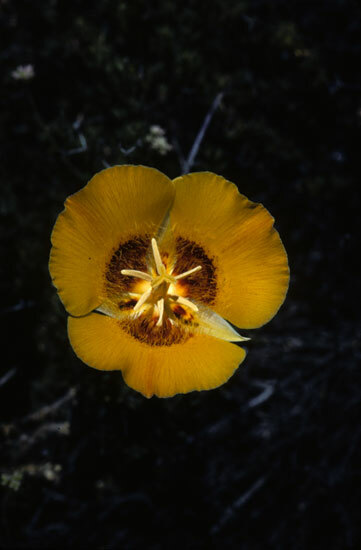 This species was seen April 2005 growing on Figueroa Mountain in Santa Barbara county in grassy areas along with Lupinus sp., Delphinium parryi and Dichelostemma capitatum. 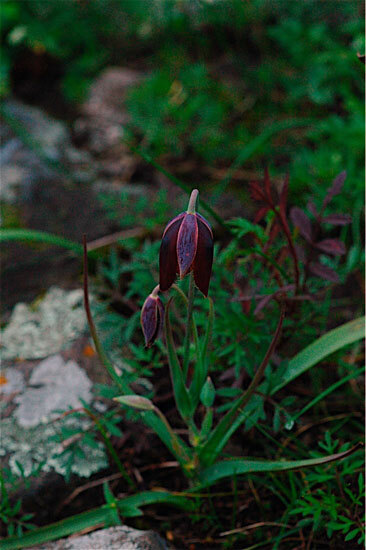 These in situ photos were taken there by Mary Sue Ittner. 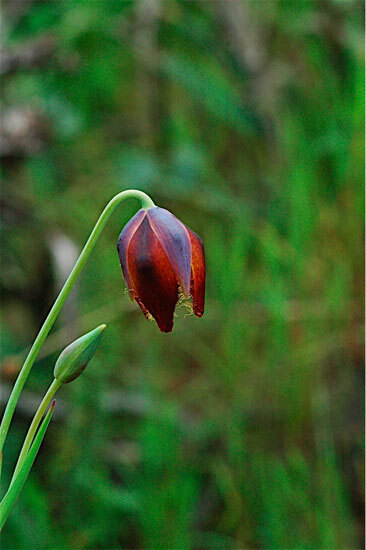 Photo #1 is of plant grown from seed photographed by Bob Rutemoeller. Photos 2-5 were taken by Nhu Nguyen. 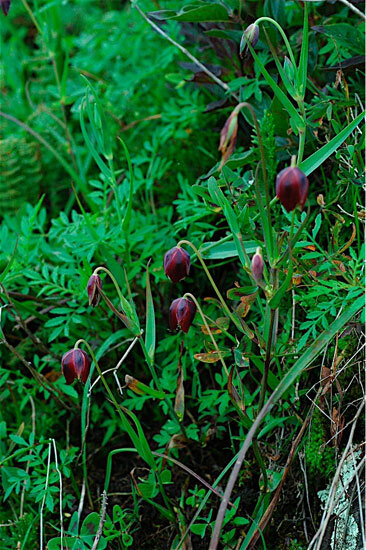 Photo 5 shows the bulbs. 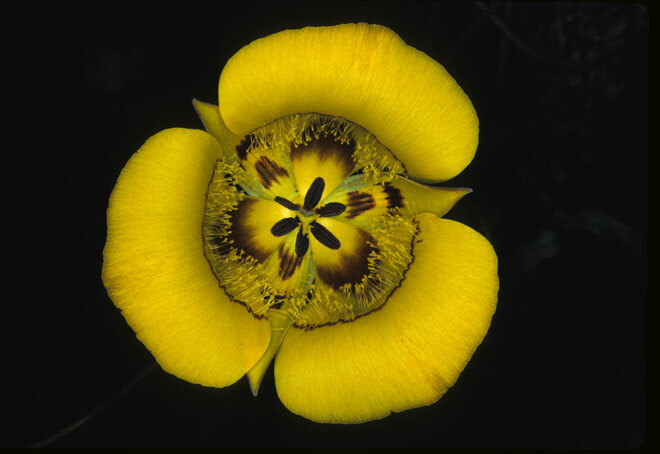 Calochortus clavatus S.Watson see the Calochortus clavatus page. 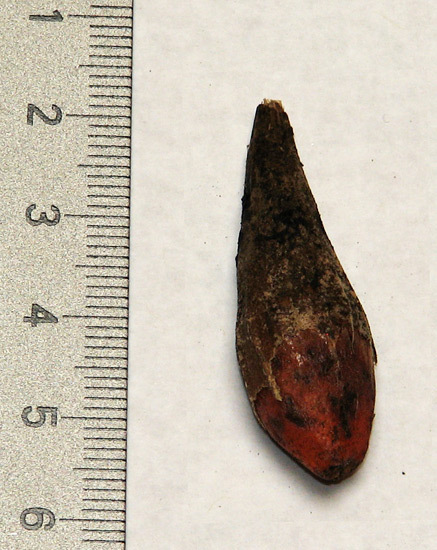 Representative photos of this species. 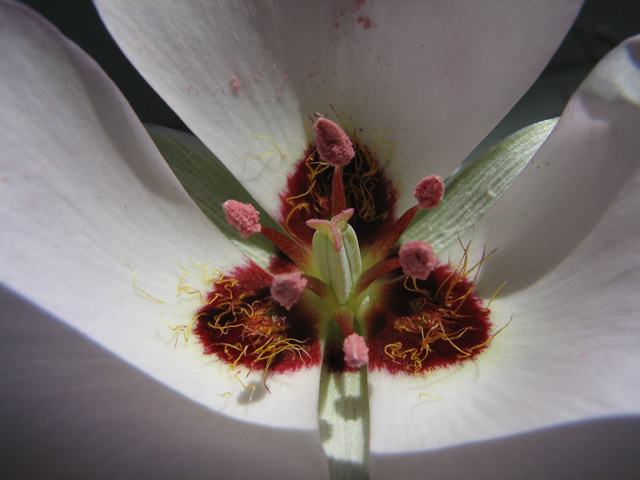 Photo 1 was taken by Mary Gerritsen, photo 2-3 were by Ron Parsons, photo 4 by Susan Hayek, photo 5 was by Bob Rutemoeller and photo 6 by Mary Sue Ittner. 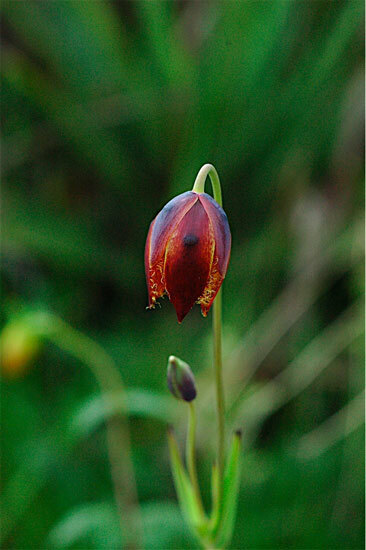 "We left the relatively towering stands of C. clavatus var avius for a nearby "lava cap" habitat where an ancient volcanic ash deposit had hardened and weathered into a distinctive, nutrient-limited soil type. 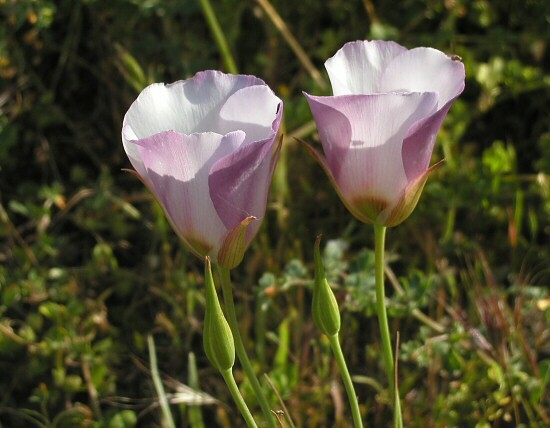 As is commonly the case in such places, geophytes were common and in addition to Brodiaea, Bloomeria and Fritillaria we also found a few small plants of Calochortus coeruleus near the southern limits of its range." 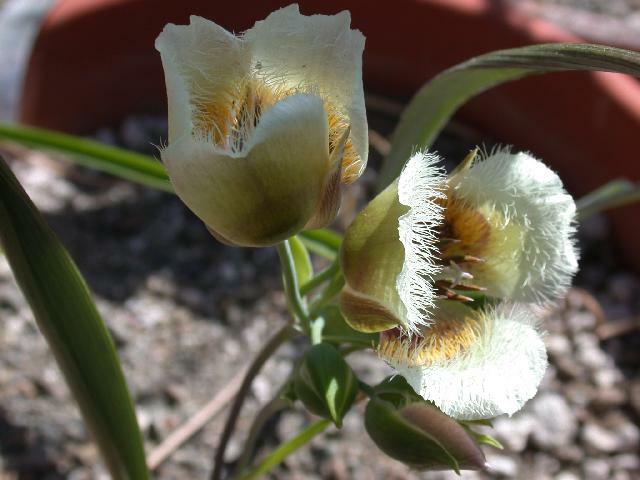 Calochortus concolor (Baker) Purdy & L.H.Bailey is a golden species with erect, commonly branched stems 20-60 cm, that can carry one to eight bowl-shaped flowers. 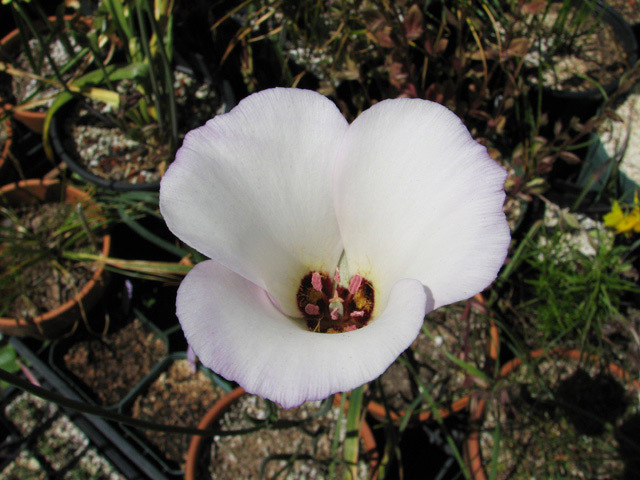 This species is found from the San Bernardino Mountains of California, south to the north Sierra Juarez in northern Baja Mexico. 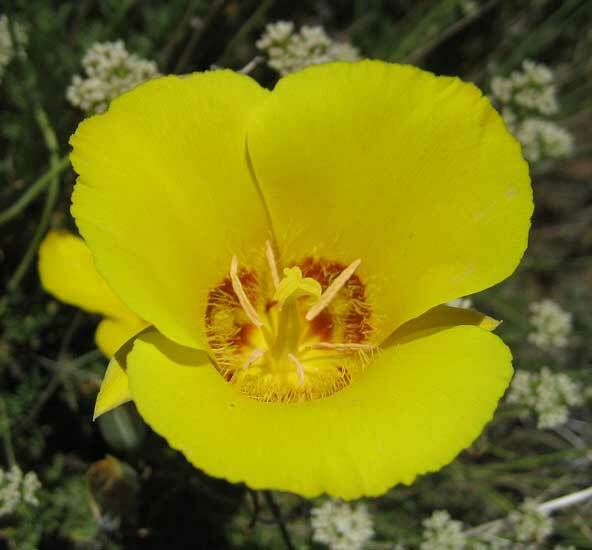 It grows in grasslands, chaparral, edges of coniferous forest, and in the desert mountains amongst the grasses, sagebrush, cacti and agave, elevations 600-2600 m. Photo #1 taken by Ron Parsons, Riverside County, California. Photo 2 taken by Jim Duggan. 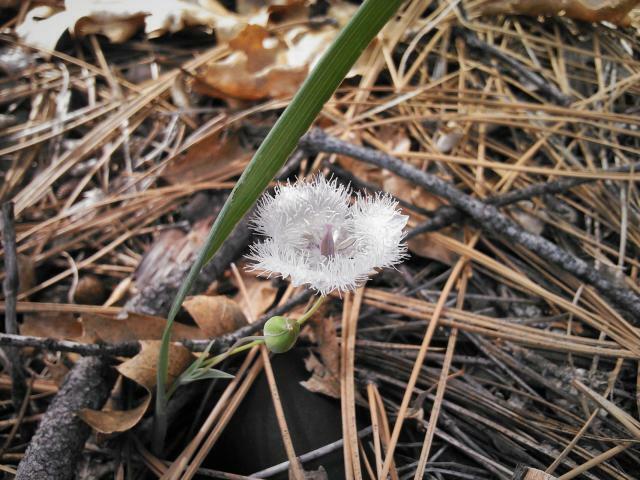 Photo 3 taken by Nhu Nguyen shows a bulb. 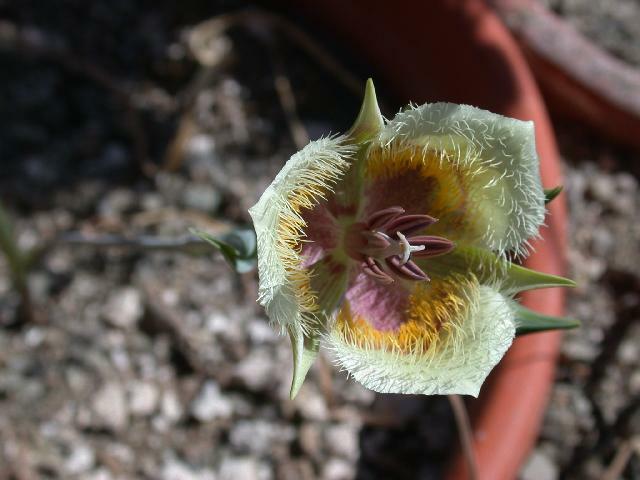 Calochortus davidsonianus Abrams is currently classified as a form of Calochortus splendens, although it may well be a separate taxon. 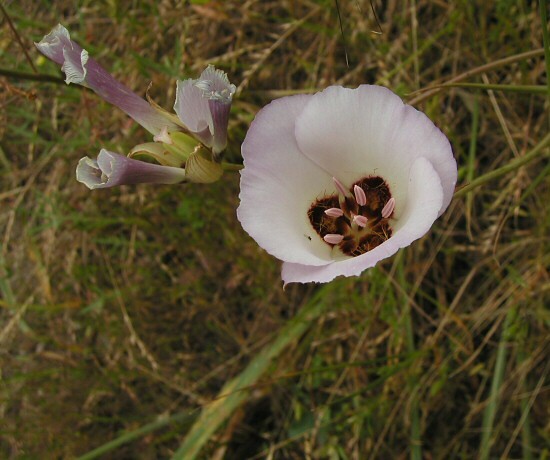 This form has more open flowers, short hairs near the rounded gland, non-bulbiferous stems and is often found in grassy meadows. 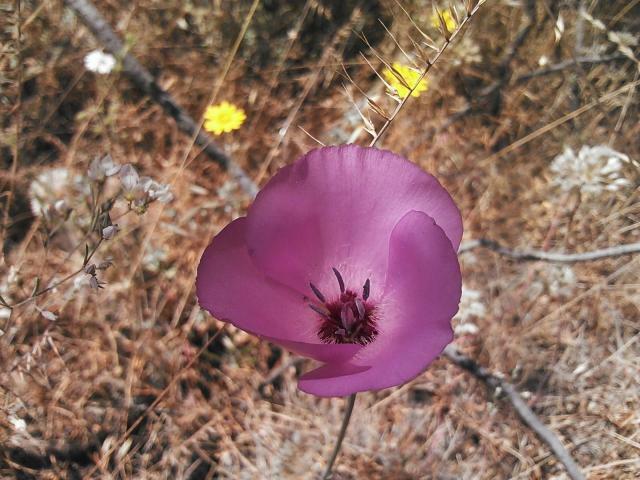 Photo 1 by Mary Gerritsen was taken in late May at the top of Walker Ridge, east of Clear Lake, California. 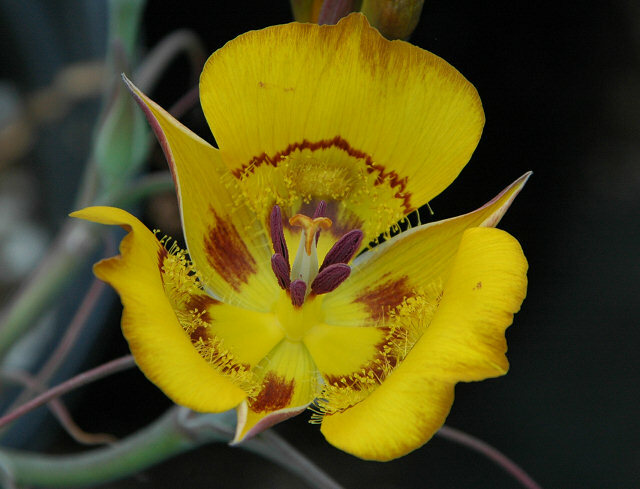 Photo #2 was taken by Nhu Nguyen of a plant in cultivation. 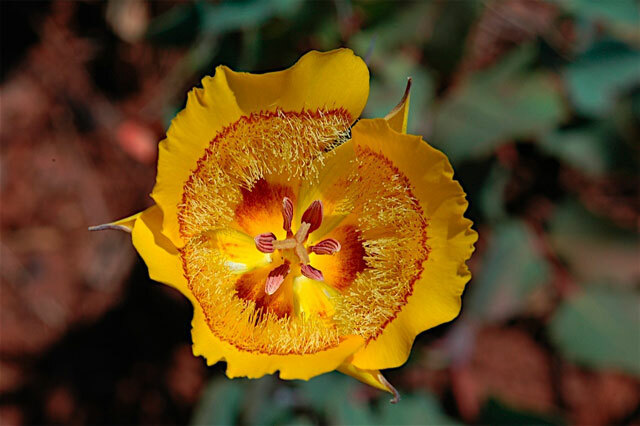 "From the old cowboy movie set terrain of Soledad Canyon, we headed south toward the hills northeast of Temecula, CA to a colony of Calochortus I had visited long after the blooming season in 2014. 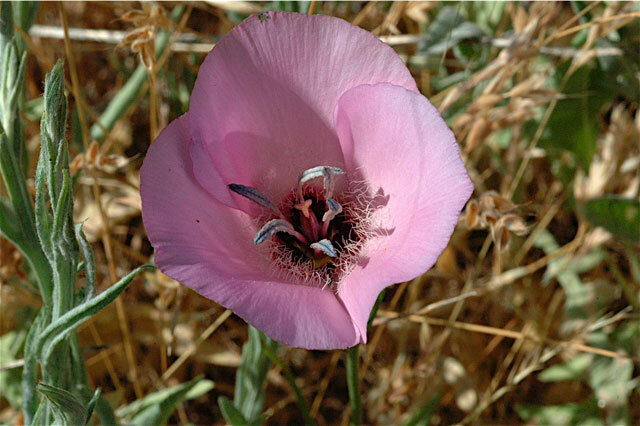 Given the area and the herbarium info I could find, I had thought this was a population of Calochortus weedi (either var weedi or var intermedius). We arrived at the access road into the National Forest to discover the gate had been closed to prevent vehicle access while a storm front moved through the area over the weekend. We were left with a decision: Hike the 2.5 miles along the road to the population or give up and move on to our next destination. 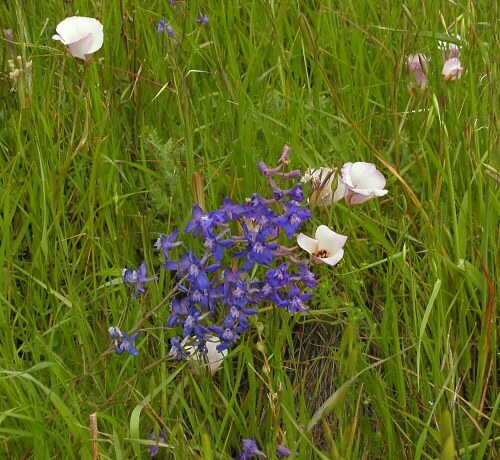 We stayed true to the cause and headed off on foot to the ridgetop locality. 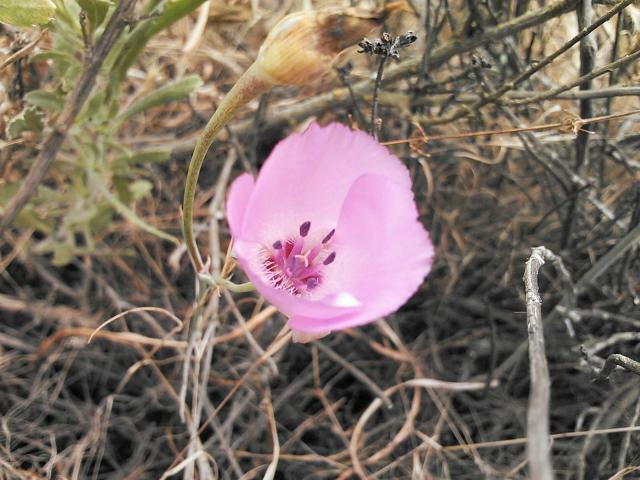 We were still a few feet from the car when we saw the first of the Calochortus davidsonianus. 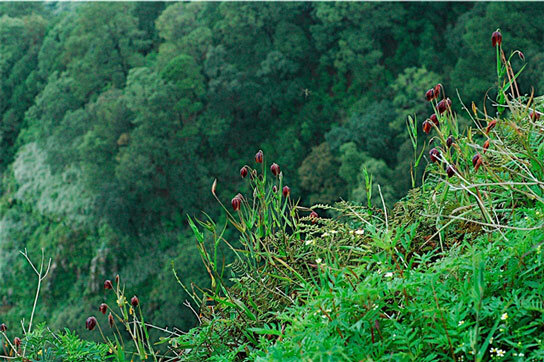 We would see hundreds of these plants, mostly in seed, on our way to the locality. 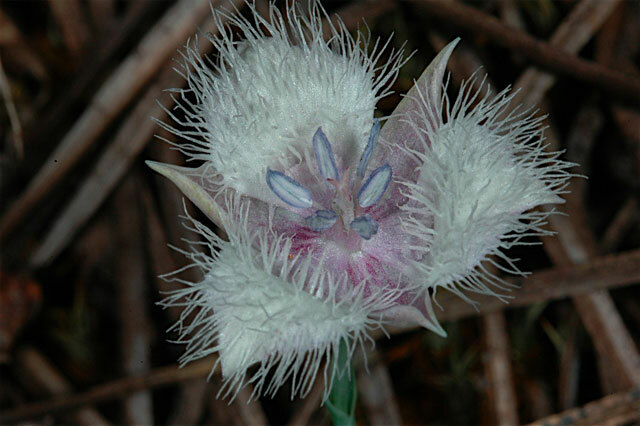 When we arrived, I discovered that what I had thought was a colony of mostly C. weedi was in fact a large colony of Calochortus davidsonianus. 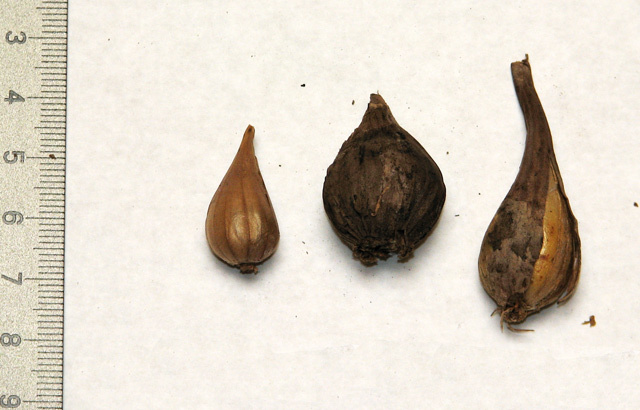 Although not a banner year, the plants here were nonetheless quite common and most had maturing capsules." 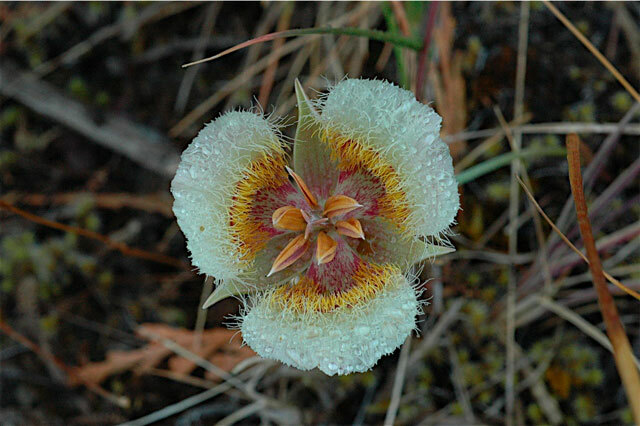 "In a return to morning trips close to Berkeley, I set my sites on stands of "Calochortus splendens" growing in serpentine soils in east Lake County. 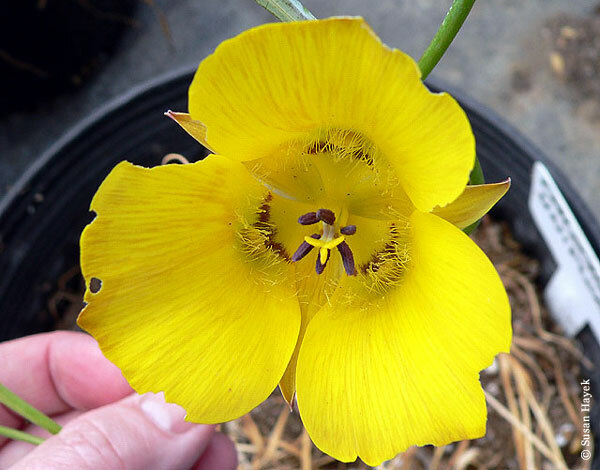 I use the name in quotes because, from my experience in the field, there are 2 different taxa contained with the official species Calochortus splendens. 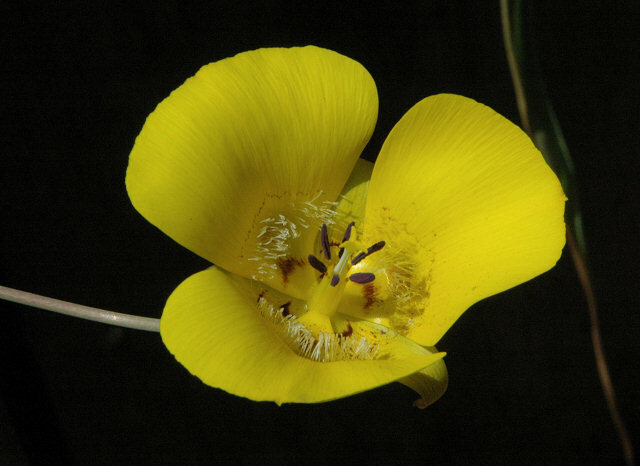 The previously mentioned Calochortus davidsonianus is the distinct morphotype of C. splendens that grows in southern California. 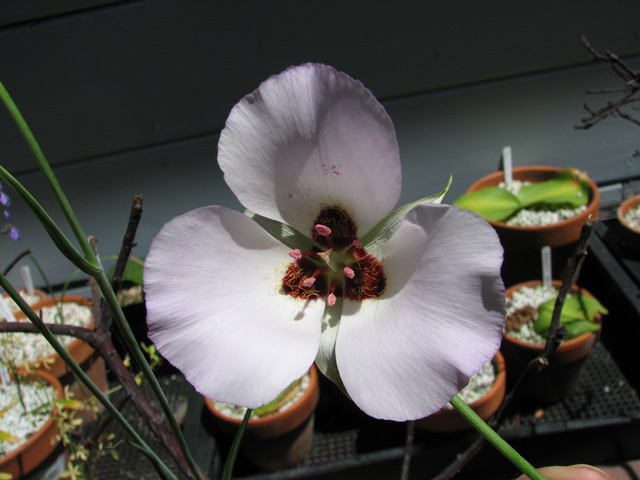 Intriguingly, the supposed Calochortus splendens that grows in northern California looks much more like Calochortus davidsonianus from southern California than it does the Calochortus splendens from areas between southern California and the Bay Area. 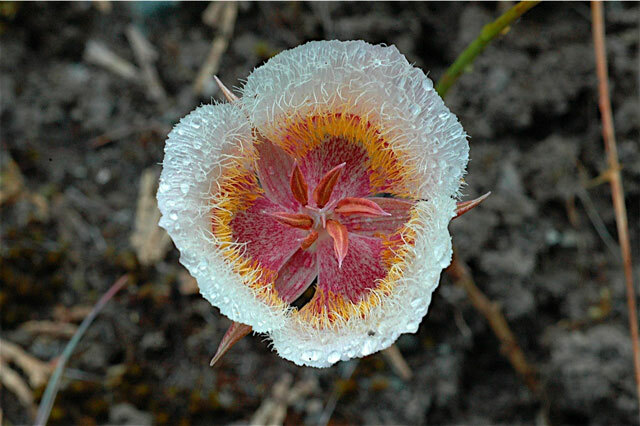 I therefor call this taxa [photographed below] Calochortus davidsonianus." 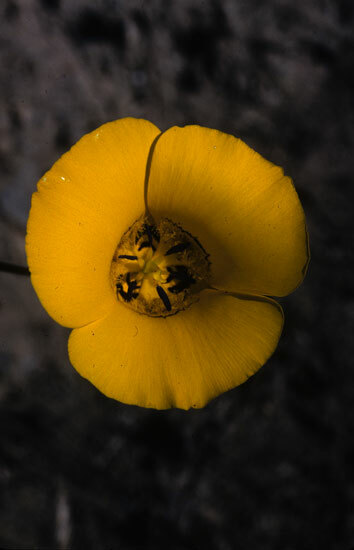 Calochortus dunnii Purdy, the smallest species of Section Mariposa, has slender, often branched stems bearing from two to eight upright, open bell-shaped flowers. 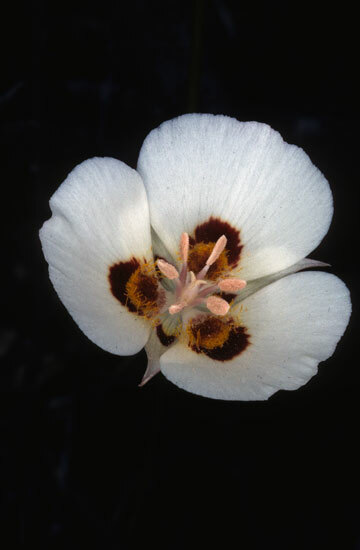 This species is found in the Vulcan Mountains of San Diego County, California, south into the Guadalupe Mountains of Baja California. 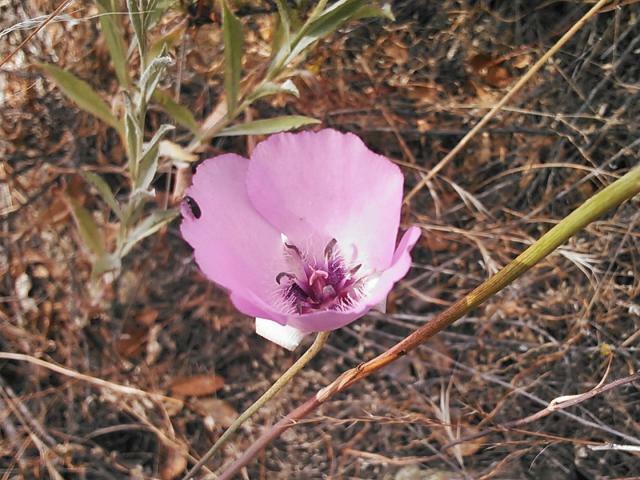 The photo below was taken in situ in San Diego County California. Photo by Ron Parsons.